Everything will be heavily tied to your garrison in the new Warlords of Draenor expansion, and professions are no exception, you can't craft anything without your garrison. Below you will find explanation for the most important changes to the crafting system. There are a lot of changes to professions in the new expansion, so I made this page to list what I gathered so far. I will update this page everytime I find something interesting in the new beta builds. Last update: november 1. Direct combat benefits of Professions will be removed. This means you no longer have to level professions to get 0.5% dps increase, so leveling a profession will be more like a personal choice now. 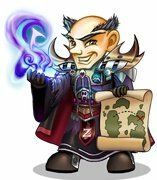 Realm First profession achievements are gone. Work orders and profession daily cooldowns convert raw materials like herbs and ores to a more useful reagent. 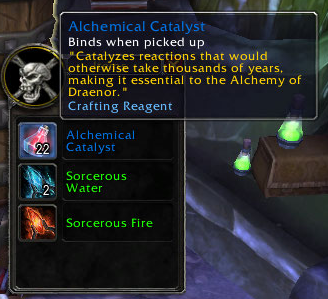 Almost every new item you can craft requires this reagent generated from doing work orders, or your profession daily cooldwon, these reagents binds on pickup. You can craft items at your garrison without having professions. But, you can't craft the best items, consumables. Herbalism, Mining and Skinning will be easier to level. You can now pick herbs, harvest mineral nodes and skin animals without a required skill. The amount of ore/herb/leather you'll get is determined by your skill level. This is similar what we have now for herbs and ores in pandaria. You can read more about this here. Herbalists and Miners will be able to gather herbs and ores with low skill in Pandaria. You will get fragments like [Ghost Iron Nugget] and [Torn Green Tea Leaf] when you gather herbs or ores. These are just a few examples, there is a fragment version for every herb and ore. (for trillium there is currently none) You can combine 10 of these fragments into a single ore or herb.